The 1000ft Mesabi Miner departed Duluth at 03:00 this morning with a load of coal destined for Taconite Harbor. Update: Looks like the balloons may launch around 16:00 today. There will be three of them. Update 08:30AM Friday-Postponed for now - possibly this afternoon. The 1000 ft Mesabi Miner arrived Duluth at 8:45 Thursday. The John G Munson slipped through light ice and off into Lake Superior late this afternoon to open the 2015 Shipping Season in Duluth. 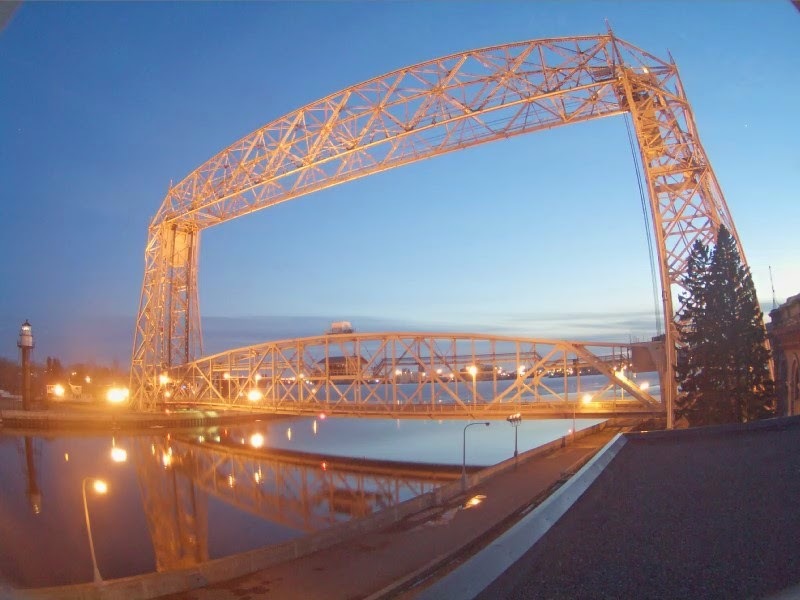 First vessel of the 2015 shipping season to depart the Port of Duluth-Superior – the John G. Munson – is now set to leave the CN Duluth Dock between 3:30 and 4 p.m. (CDT) today, make its way through the harbor and head out beneath the Duluth Aerial Bridge. 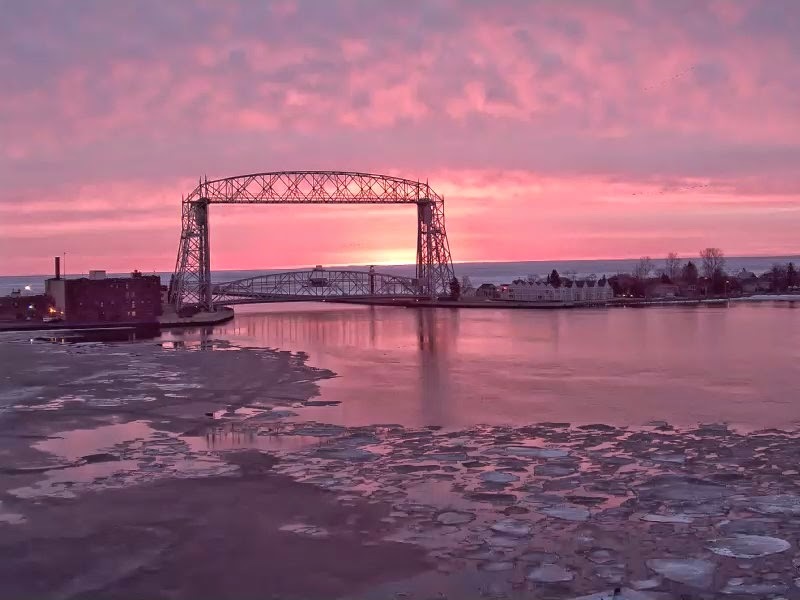 The Mesabi Miner is expected to depart sometime after 7 p.m.
FYI, The Pier B and Bayfront camera streams will be down until Monday AM. The snapshot feeds are still working. Duluth, Minn., USA (March 20, 2015)—The first two U.S.-flag lakers are on schedule to depart the Port of Duluth-Superior on Monday, March 23, signaling the start of the 2015 commercial shipping season at this end of the Great Lakes St. Lawrence Seaway system. On Sunday morning, the John G. Munson, with an assist from Heritage Marine tugs, is set to move from its winter berth at Fraser Shipyards in Superior to first fuel at the Port Terminal then shift over to the CN Duluth Dock to load 24,000 short tons of iron ore pellets. On Monday morning, the Munson is slated to depart beneath the Aerial Bridge, destined for Gary, Indiana. Late Monday afternoon/early evening, the Mesabi Miner is expected to depart from the Superior Midwest Energy Terminal with some 57,000 tons of coal onboard for the power plant at Taconite Harbor. After making that delivery, the 1,000-footer will return to the Twin Ports for a couple of days of scheduled maintenance work and to load its next coal cargo. 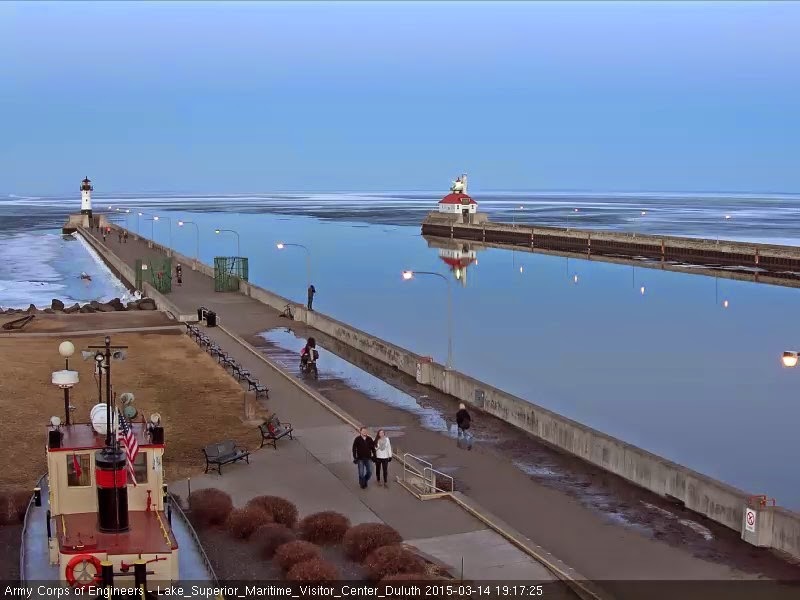 While Lake Superior looks bright blue in the early spring sunshine here in Duluth-Superior, there is still a significant amount of ice cover on the eastern edge of the Lake – two to three feet thick from Whitefish Point to the St. Marys River. As such, U.S. Coast Guard cutter Alder will be working in tandem with USCGC Mackinaw to lay tracks and provide escorts for vessels as needed through that eastern ice pack to and from the Soo Locks. At this point in time, the Munson is expected to be the first downbound commercial vessel in position to transit the Soo Locks this season. It also appears there may be four upboundvessels waiting below the Soo Locks when they reopen at 12:01 a.m. on Wed., March 25 – including the Edwin H. Gott, Edgar B. Speer, Roger Blough and the Algoma Olympic. The Soo Locks provide the gateway for lake carriers – some measuring more than 1,000 feet in length – to move raw materials like iron ore, coal, limestone, cement and salt between Lake Superior and Lakes Michigan, Huron and Erie. It is also one of 16 sets of locks along the Great Lakes St. Lawrence Seaway (GLSLS) that allows oceangoing ships (“salties”) to move breakbulk and project cargoes in and out of North America’s heartland and deliver Midwestern grains to Europe, the Middle East and North Africa. It’s a bit harder to predict the arrival of the Port’s first oceangoing vessel. The Seaway locks (the Montreal/Lake Ontario section and Welland Canal) won’t reopen for business this year until April 2, so it will be at least another week later before the Port of Duluth-Superior will see its first saltie. 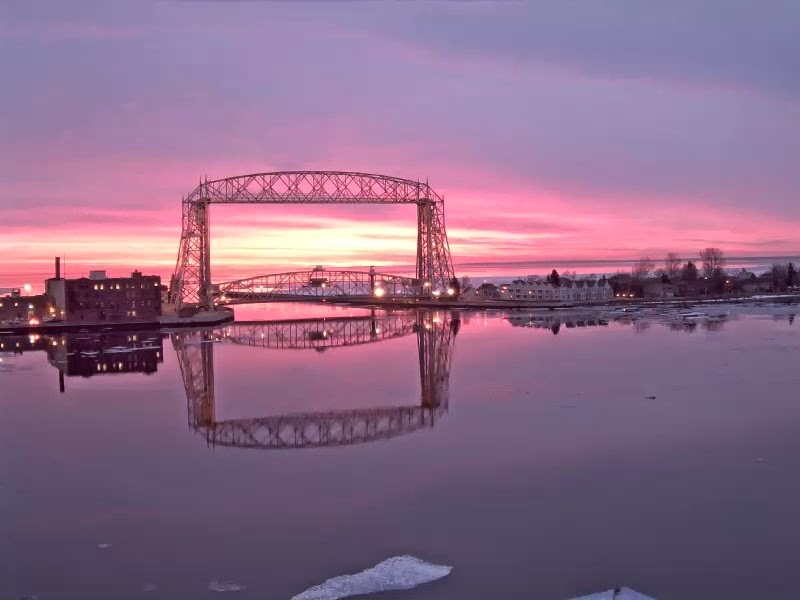 That first saltie to pass beneath the Aerial Lift Bridge will be greeted by maritime officials with a welcoming ceremony and will also qualify a winner for the annual “First Ship Contest” sponsored by the Duluth Seaway Port Authority and Visit Duluth. Last year, due to dramatic ice conditions, the Port’s first saltie, the Diana, didn’t arrive until May 7 (the latest on record). 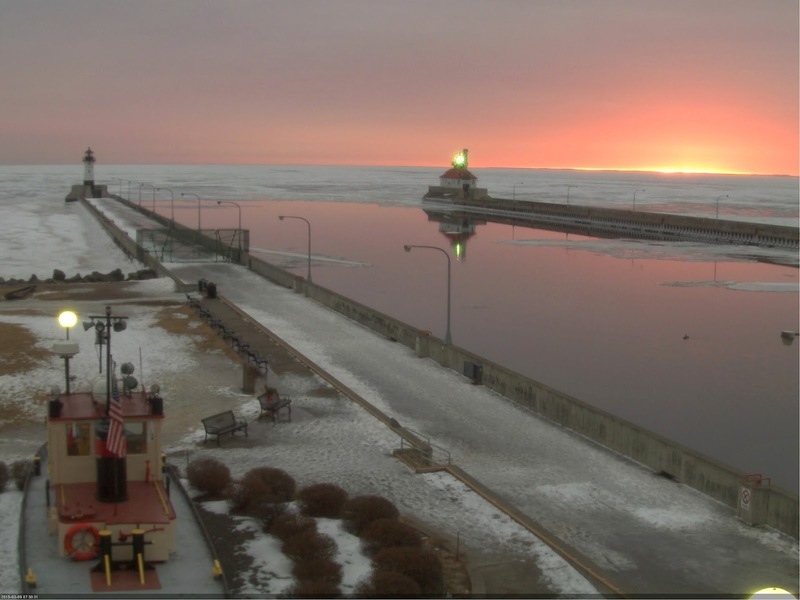 Of the five vessels that wintered over in the Twin Ports for repair and maintenance, the remaining three – Kaye E. Barker, American Integrity and the Indiana Harbor – aren’t scheduled to depart until late March or early April. The CGC Alder departed this morning through the rapidly melting ice and returned shortly after. 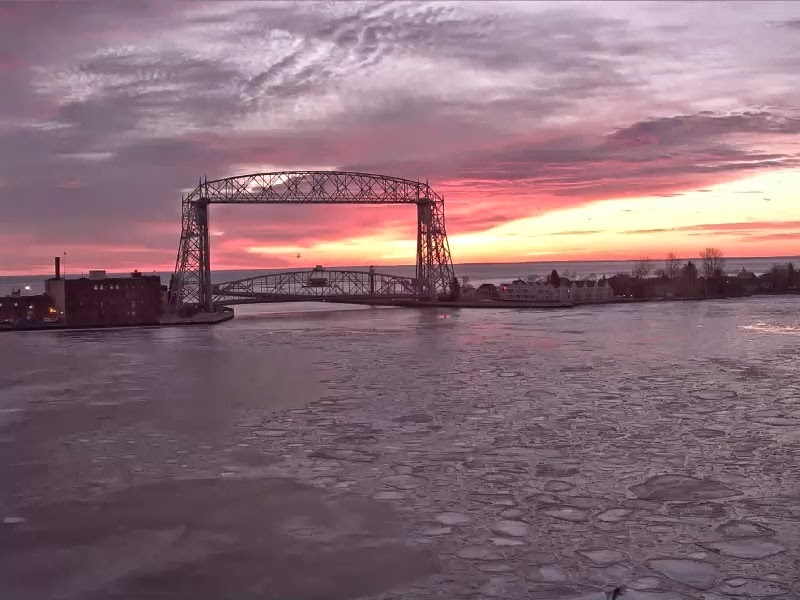 As usual, the CGC Alder pushed under the Duluth Aerial Lift Bridge and out through the Shipping Canal as a preliminary run for the shipping opener that will be coming up soon. Good to hear the boats again. 3/11/2015--12:00 Canal Cam upgrade complete - let me know if you have any issues with it. The view should be clearer and I will tweak the audio once there are boats moving. Thanks again to everyone that donated for the new camera and I hope you enjoy the view. The Canal Cam will be down today for several hours as I change it out to an upgraded model. I apologize in advance if it takes longer -- there are usually some glitches to work through. This coming Wednesday, I will be replacing the Canal Cam with the new one that we raised funds for last December. The image will be clearer with better dynamic range. I will also be moving the camera mic into a better location to hear the announcements. With any luck, it will be the best cam on the Great Lakes. That said, there will be a several hour outage while I make the changes. Once again, thanks to everyone who donated to these projects. The new Pier B complex is now under construction which has cut off access to the PierB camera for the time being. Once I can access the camera, we should get it back. It may be awhile however. Although it isn't the same, I have put the Pier B Costruction Cam in it's place for now. Want to buy the Tall Ship Peacemaker! 360 Virtual View ---- Click image to look inside. Once the Flagship of the U.S.Steel Great Lakes Fleet, the William A Irvin now works as a harbor-side museum for tourists and residences alike to view a piece of our nautical heritage. 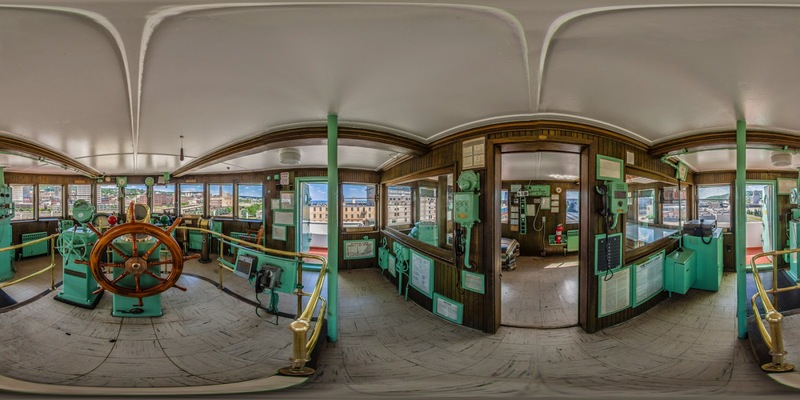 Take a 360 peek into the Irvin's Pilothouse by clicking on the image below. Since it finally warmed up today, I fired up the photo copter to take a closer look at the Wisconsin Point Lighthouse. The lighthouse, built in 1912 is the most beautiful and unique of the Twin Ports lighthouse and the most difficult to see up close. Find more info about the lighthouse HERE. Notice the ice fishing houses further out on the lake. Even though Spring is just a few weeks away, it's good to see a fresh snowfall. I enjoy taking snowflake pictures like this one every now and then. The wonders of "Little Things" never ceases to amaze me. Congratulations to Ken Newhams who's Duluth Shipping News has reached 20 years old. Ken has provided a tremendous service for all the nautical fans around Duluth-Superior. On top of that, he's a great guy.